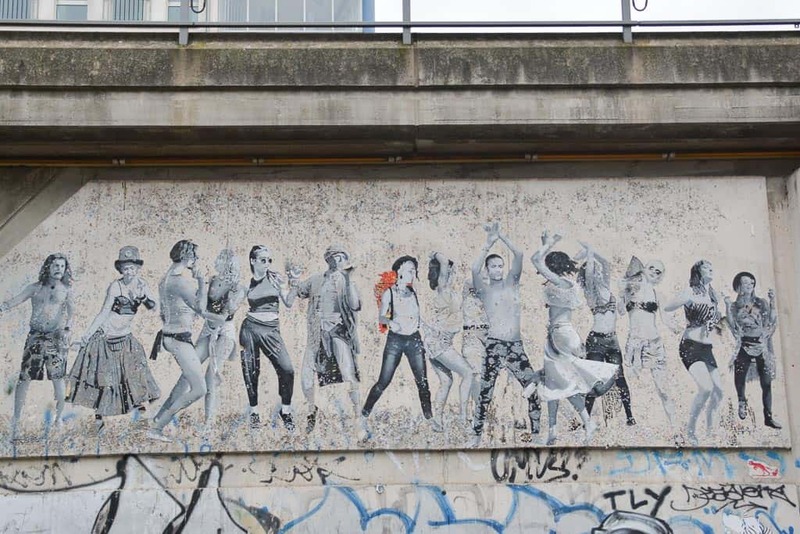 You are looking for a way to discover Berlin’s amazing street art on a self-guided tour? Don’t know where to start, how to get there and what to look out for? No worries! As a local who is very much in love with Berlin’s street art I am always on the look-out for the best street art spots in Berlin. In this article I will show you where to find street art, from large murals to stencils and paste ups. I put it all in a map so you can look it up yourself, but I have also included an itinerary on the bottom which will help you navigate the public transport system for your self-guided street art tour. The following places are very good to visit when it comes to street art. Note that these are certainly not the only places (Berlin attracts graffiti and street art like honey the flies, it seems). But in my opinion these are the best of the best. I always love to go back to these places because, luckily, street art has the tendency to constantly re-invent itself, so there is always something new to discover. From naughty to nice, from political to abstract – these public artworks are always great fun! 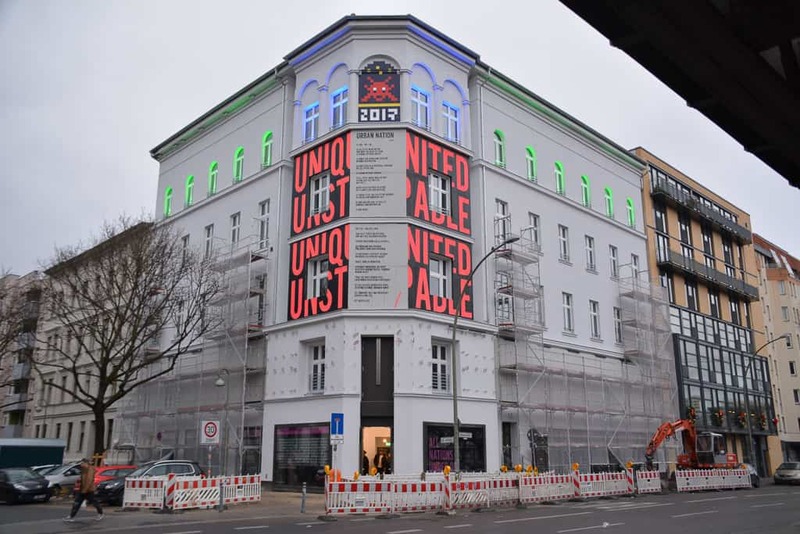 Urban Nation is a cool Berlin art gallery which focuses on young artists and street artists. Entry is free. Urban Nation is a relatively new art gallery which offers a suitable framework for street art and urban art. You will see an interesting collection of young and upcoming artists. It’s a great introduction if you want to get to know the different styles and developments over place and time, techniques and topics. Strictly speaking, Urban Nation is not just a street art museum but an urban art museum. However, street art is very much part of it, and the way the colourful facade takes out art to the public is a great statement which can be seen from near and far. In fact, many other houses in the neighbourhood and along Bülowstrasse are painted with giant murals as well. Entry to the Urban Nation museum is free. I wrote more about it here. This mural by artist Blu is among the best known Berlin street art murals. Skalitzer Strasse is one of the main artery roads in Kreuzberg which is lined with a mix of apartment blocks and office buildings. There are some wonderful examples of Berlin street art here. When approaching the street from Friedrichshain, crossing Oberbaum Bridge, check out the walls of the adjoining building. 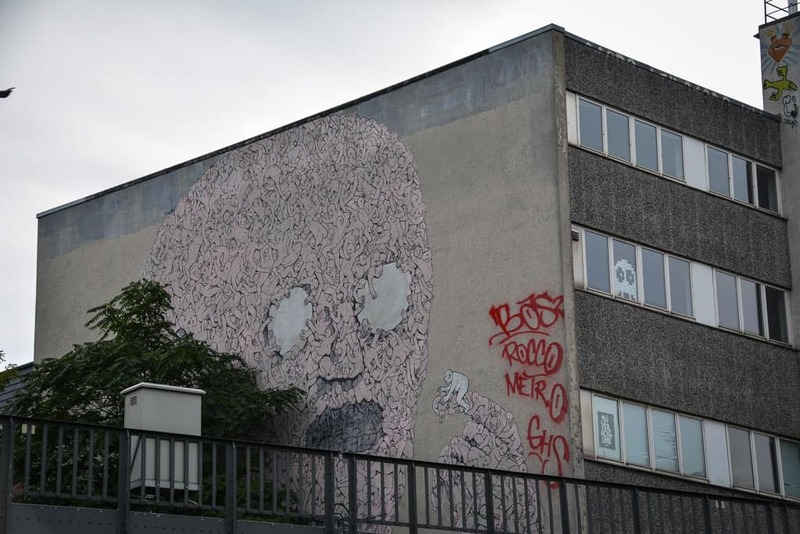 There is a big mural by Italian artist Blu called Pink Man or Leviathan. It is basically a head made up of naked bodies eating more naked bodies. On the front of that same building there are two skeletons painted in a red-blue 3D technique by Greek artist Insane51. Insane51’s artwork is best thing with a pair of old-school 3D glasses. One of Berlin’s best known murals can be found just a couple of steps further down the road, Victor Ash”s Cosmonaut. Painted in 2007, it shows a weightless astronaut in black and white. In the neighourhood of this but also in lots of other places around Berlin, you may spot the daring artwork by the local street art team Überfresh. They also leave behind colourful, rather cryptic letters. With them, it’s not so much about aethetics, I’d say, but rather the fact that this artwork needs to be done while abseiling from the roofs of the buildings. Illegal work, that, once repainted by the home owners, will usually reappear just a couple of weeks later. 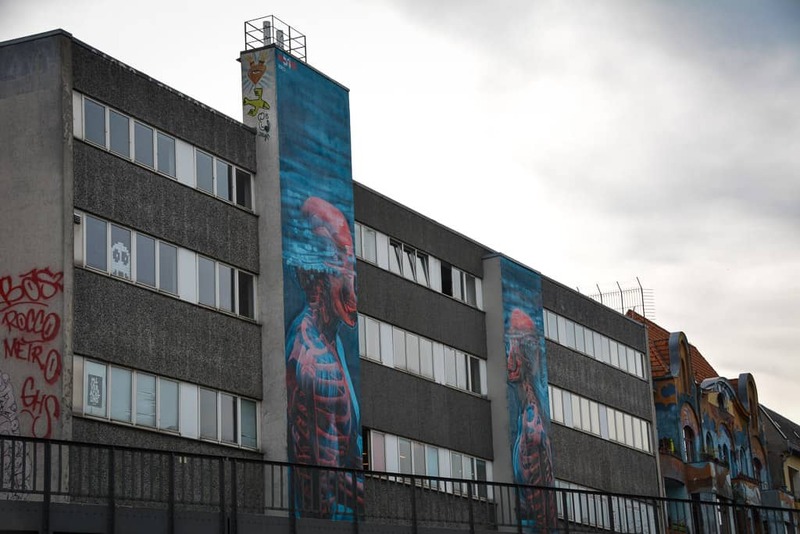 The artwork of Berlin street art team Überfresh appears overnight and requires a dangerous and illegal abseiling act from the buildings’ roofs. The RAW-Gelände in Friedrichshain is a derelict industrial area which has been turned into a nightspot and alternative art space. It is a curious mix of abandoned and ruined industry halls, artist studios, night clubs, broken tarmac and shattered glass. The artwork on the RAW-Gelände changes all the time. How long we will still enjoy this space remains to be seen. At night, revellers like to party to the beats of the Berlin techno scene. But during the day, one can stroll amongst the buildings and admire the skillfully applied artwork on the old brickwalls. It is not clear as to what fate may befall the RAW-Gelände but chances are that this special Berlin place will come to an end very soon. It would be great if in this case the city would refrain from erasing a cultural grassroots space to make room for yet more luxury housing. 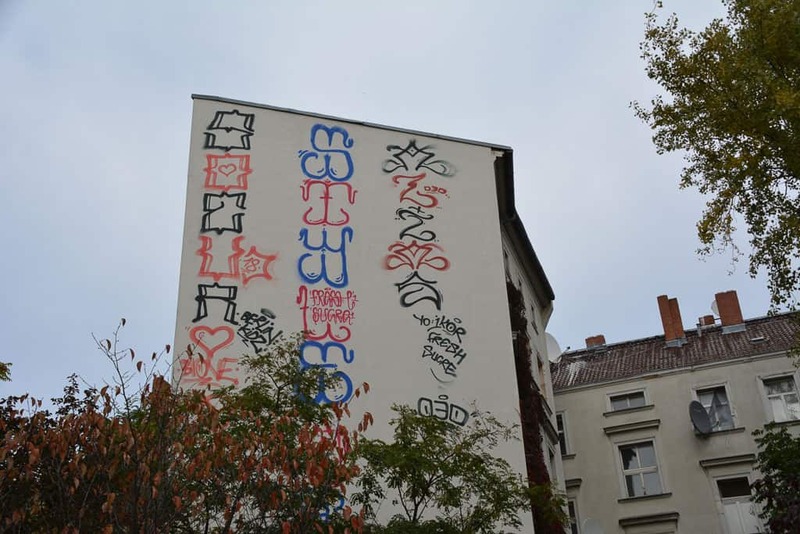 Rigaer Strasse is hardly ever featured in travel guides, not even the specialist guides that focus on street art. That’s because it’s not a street art location in the classical sense. The point is not to entertain the public with colourful murals. The truth is that Rigaer Strasse is one of the last focal points of radical left-wing supporters who have taken over abandoned houses to save them from further development. It is them who have painted the facades of the occupied buildings in the most colourful way. As such, Rigaer Strasse is not a place where you should show up with a massive camera and pose in front of the houses. The paint that you will see here is expression of political protest. 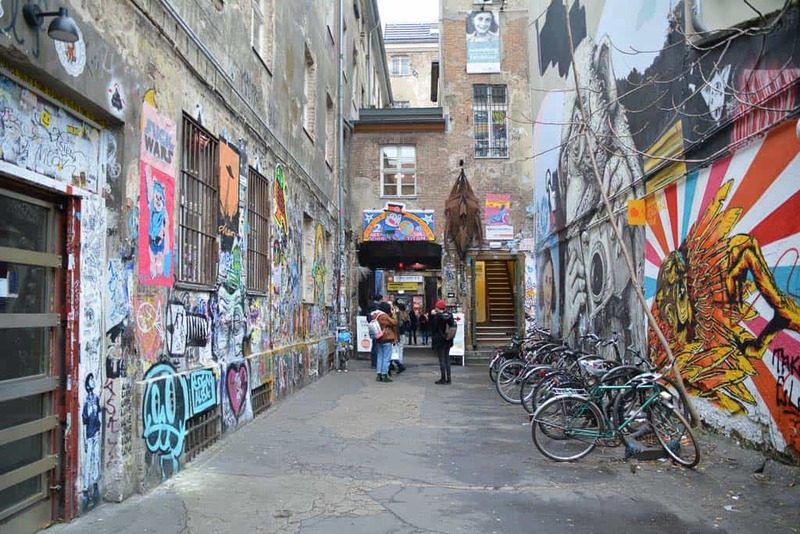 If you are interested in this alternative and underground side of Berlin, this street should be added to your itinerary. Haus Schwarzenberg is a public cultural project where street art is not just tolerated but also encouraged. Haus Schwarzenberg is not far from the glitzy luxury world of Hackesche Höfe, the place that is featured in all tourist guides and that is a prime example of Berlin tenement living with a modern twist. Many tourists won’t know it but just next door is another set of inner courtyards that look rather differently. It is hard to believe that the courtyard of Haus Schwarzenberg is the last to remain from a whole area that looked this way after the fall of the Berlin Wall. Lucikly, the Berlin Senate has agreed to preserve the space in its current state to offer artists a space for their art. 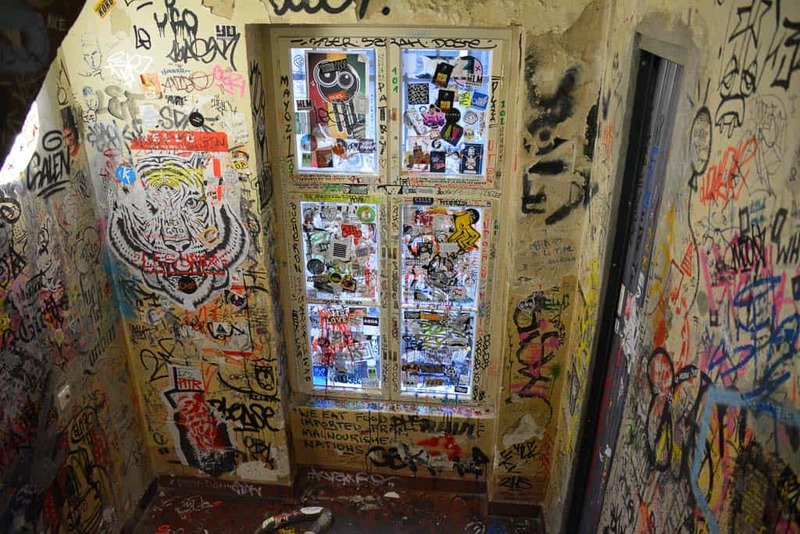 The staircase of Haus Schwarzenberg is a mess of scribbled tags and stickers. 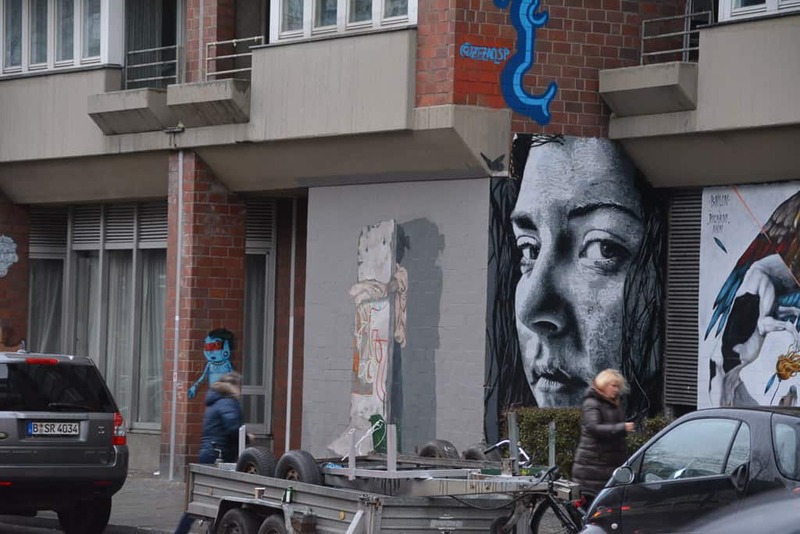 The murals, stencils and paste ups in this courtyard change all the time, but there is one that will not change: Australian artist Jimmy C created a pretty portrait of Anne Frank in a dot technique just in front of the Anne-Frank-Zentrum. My favourite part of this area, however, is Haus Schwarzenberg itself. You may find an open door in the left-hand corner, and behind that a stairway which is covered from head to toe in scribbles and stickers. Good fun! The East Side Gallery is one of the best known Berlin attractions. On it, artists from around the world have left their impressions on the political change just after the fall of the Berlin Wall. East Side Gallery is one of the best known street art spots in Berlin. I only walked past there last Sunday and was amazed about how popular the side still is with visitors from around the world. The East Side Gallery is of course a section of the former Berlin Wall, painted by local and international artists just after the fall of the Wall. The artwork you will see here is a reflection of the time and the change that happened not just in Berlin but all over the world. 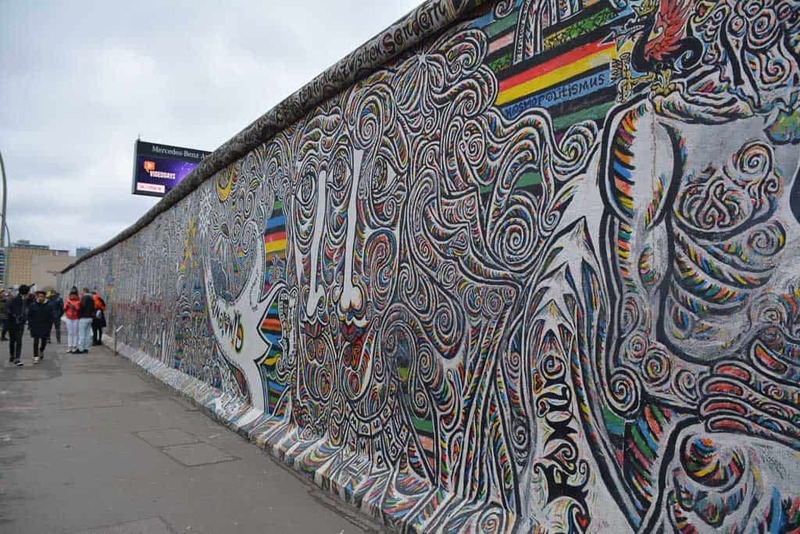 After some debate and ups and downs it has now been decided that the East Side Gallery needs to be protected as an object of cultural relevance. I have written about it earlier, have a look here. In the neighbourhood of Urban Nation, along Bülowstrasse, you will find a curated gallery of street art and murals. If you happen to also visit the Berlin Wall Memorial in Bernauer Strasse you may come across a giant life-like painting of meat. The Steak Art Mural by Marcus Haas is meant to remind people of a city divided. One of my favourite, rather obscure street art projects are the little street yogi figures that you may see on some of the Berlin street signs. They are made from wire by the Berlin artist named Josef Foos and show figures in different yoga poses. Near Görlitzer Platz in Kreuzberg, at the beginning of Oranienstrasse there is a huge mural by popular street artist ROA. This Belgian artist tends to create huge murals in black and white depicting animals, very often with a rather morbid twist. In this case, you can see different game hanging from the ceiling on one leg, the kill of a hunt perhaps. In many places around the city, in particular under the arches of the S-Bahn you may notice beautiful pictures with young, happy dancing folk in a rain of confetti: It’s Time to Dance. These are created by French artist SOBR, and seeing them always makes me ridiculously happy. In 2018, Berlin hosted its first Berlin Mural Fest, a street art festival which invited artists from around the world to leave their mark on 22 walls around the city. Let’s hope that Berlin will see the potential of continuing with this project so that we get an ever changing line-up of new and inspiring artwork in the city. The best way to see Berlin street art is by making use of the public transport. If you haven’t done so yet, buy a day pass for 7 Euro so that you can move around the city freely for the day. Start at Hackescher Markt and visit Haus Schwarzenberg and the adjoining courtyard. The address is Rosenthaler Str. 39. Take subway U8 to Gedenkstätte Berliner Mauer to check out the Steak Art Mural on one of the houses behind the former death strip. Change to tram M10 and travel all the way to stop S Warschauer Strasse to see the colourful RAW-Gelände. From here it’s just a couple of steps across Warschauerbrücke which spans the railway tracks to get to the East Side Gallery. You can follow the Wall for ages but for the purpose of this tour only go as far as you are willing to go back to the starting point. Walk across Oberbaum Bridge. Soon after, you will see the mural by Blu. Just walk straight and there will be more murals to see on both sides of the street, including the artwork by Überfresh, the Kreuzberg Cosmonaut and the mural by Roa. Get back on the train at Kotbusser Tor and use U1 or U3 to get to Bülowstrasse. Keep an eye out for artwork along the way as you travel on the train. Get off and head to Urban Nation Museum, Bülowstrasse 7. Berlin Street Art: 3-Hour Off The Grid Tour: English-language tour for deeper insights into the Berlin street art scene. Click here to check for details and rates. Berlin Street Art and Graffiti Tour and Workshop: Don’t just look at street art but become an artist yourself! Click here to check for details and rates. 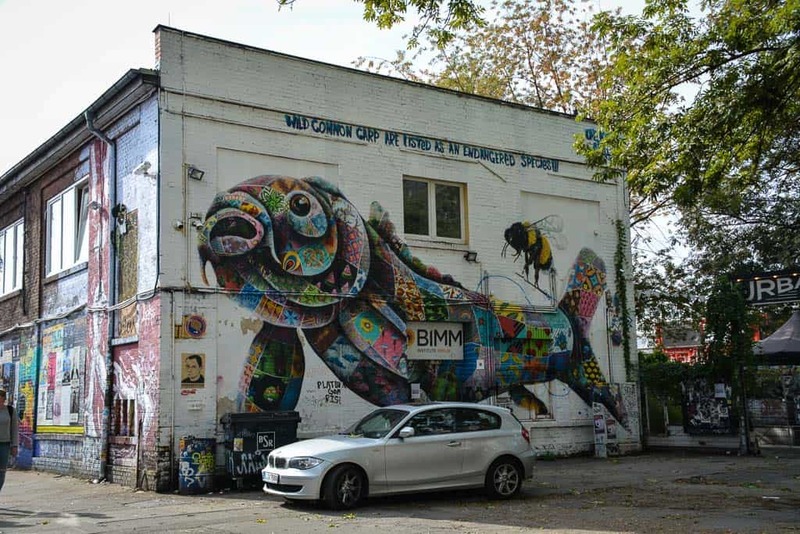 New Berlin Alternative City Tour: Not just a street art tour but an introduction to the alternative scene in Berlin. Click here to check for details and rates.